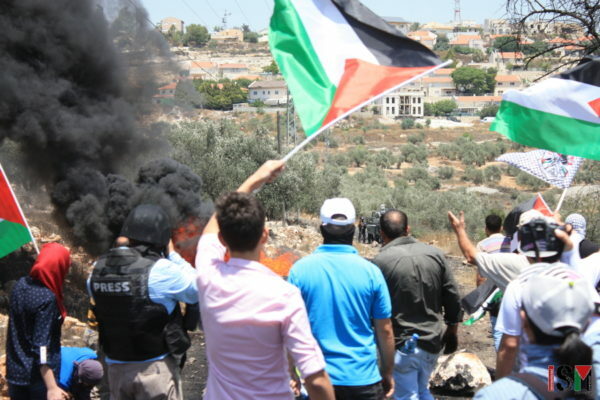 Hebron, occupied Palestine – On Friday 7th of July the residents of Kafr Qaddum gathered for their weekly demonstration marking its 6th anniversary, which was repressed by the Israeli forces shooting teargas, stun grenades and rubber-coated steel bullets at demonstrators. 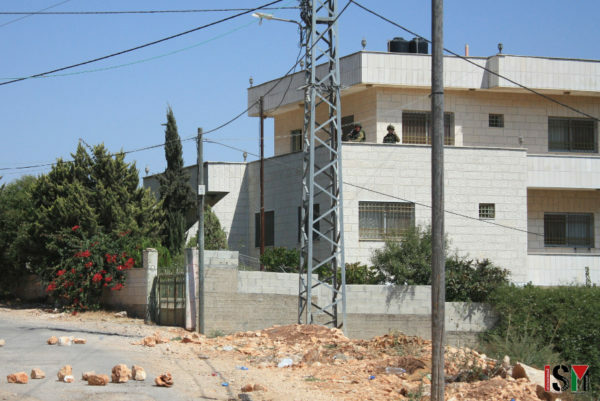 Israeli forces approached the demonstrators in a jeep and were seen on a hill next to the road connecting Kafr Qaddum and the Israeli settlement. Towards the end of the demonstration Israeli forces also forced their way into a Palestinian house to use it as a vantage point to aim at the demonstrators. After the afternoon prayers at 1 pm, the people of Kafr Qaddum started their non-violent demonstration marching towards the illegal Israeli settlement of Kedumim. Soon after, the Israeli forces welcomed the demonstrators by shooting rubber-coated steel bullets and teargas. 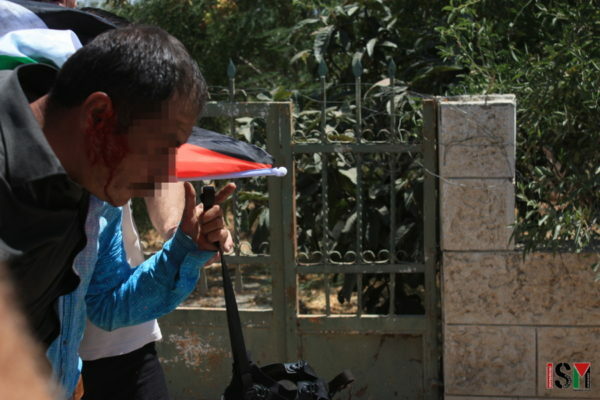 Halfway through the demonstration, an elderly Palestinian man was shot in the head with a rubber-coated steel bullet while taking cover from the shooting. Towards the end of the demonstration, an additional five Palestinians and a Korean activist were injured by the Israeli forces. Those who were injured were taken to receive treatment. According to information provided by the Israeli military spokesperson to Ma’an news, no Israeli army forces were present at the demonstration, but instead it was the Israeli police that repressed the non-violent demonstration. This however is not true, as later during the demonstration Israeli army soldiers were seen at a nearby hill, and soon replaced the police on the road with more jeeps and an armored personnel carrier. The soldiers then proceeded to fire rubber-coated steel bullets at protesters and activists, and threw several stun grenades in an attempt to disperse the demonstration. Israeli soldiers also forced their way into a house and took up positions on the balcony overlooking the road. The simple reason for the coming collapse of what we call the European Union is the essentially unjust, unequal, undemocratic, and punitive nature of its basic legal structure. The EU Commission and other arms of the (unelected) bureaucracy work happily in that structure, increasing anti-democratic tensions. Their connection with the Imperial Globalizers is almost flagrant. But the source of trouble lies in The European Court of Justice, the Community’s (apparently) highest authority. Very much of German response and (guarded) acceptance of EU “treaty-making” is marked by what is called the “as long as” clause in German ratifications. That clause states that “as long as” all fundamental rights are not guaranteed by the European Community, all new treaties must submit to strict respect for the sovereignty of the German people as written in their fundamental law. That most powerful nation in the European Union declares, in fact, that the European Community is structured as a threat to fundamental human rights and freedoms. Not much more needs to be said. The present situation explains the (apparent) flailing of new political formations in Europe (and Britain), trying for a grasp on power. Since the tendency of EU national governments has been acceptance of undemocratic power in the Community, and since the mainstream media and “respected” commentators support the undemocratic basis of the Community, the first resistances have been eruptive, uncertain, belligerent. UKIP in England, Marine Le Pen’s National Party in France, The Five Star Movement in Italy and other like formations have not been welcomed in “acceptable” circles. They are deemed, condescendingly, to be “populist movements”. The word takes its meaning from a nineteenth century, U.S. Party wishing to broaden democracy, to nationalize some infrastructure (i.e. Railways), to limit private ownership of land, and to use a graduated tax system. The term ‘populist’ was also used of a movement in Russia (very early) seeking increased collectivism. Clearly the smell of democracy hangs about the word “populist”. And so the persistent use of the word as a pejorative says much. With all their faults, the “populist” parties in Europe began the demand for action to work against what might fairly be called “creeping fascism” in that Community. The whole fake target – immigration and immigrants – might be seen, among the new political forces, to be a simple matter of their racism and inhumanity. Except for one thing – the wealthy, the coddled corporations, and international capital want a borderless Europe in order to move low-wage earners from poorest countries across the Community to help force down living standards … and raise profits. That fact becomes obscured by the unique problem caused with the flood of immigrants pressing for acceptance in Europe as a result of the ravages left by Western countries seeking “regime change” in the Middle East. “Good” political activities, according to the Mainstream Press and its owners are ones like that of Matteo Renzi in Italy (Centre Left) which recently tried to reduce democratic responsibility of the elected by referendum – and was rejected. Or like Emmanuel Macron’s new French “En Marche” Party, a neo-liberal force that also wants to bridle democracy, in France. Macron, like Renzi in Italy, has announced he is willing to go to referendum in his attack on democracy – if he can’t get what he wants through France’s National Assembly. (Both, of course, put forward the claim to want to streamline democracy and speed it up.) The surge of support for Macron in France was almost a desperation measure after the “Socialist” government of Francois Hollande sold out completely to the European Commission and international capital. Macron’s solution is no solution … as time will tell. In England, Labour Leader Jeremy Corbin points to the biggest symptom of “creeping fascism” in Britain, calling it the folly of “The Austerity State”… the situation in which the general population is increasingly undefended and subjected to ‘precarious’ living, while the wealthy are coddled, corporations are given free rein, and international capital is the de facto legislator. In confronting The Austerity State and vowing to change it, Jeremy Corbin (specifically) and the British Labour Party he leads are climbing in popularity, as the European population – misled by the European Commission, its bureaucratic back-up, and their ‘owned’ media – is finally coming to a slow understanding about where real power resides in European “government”. Plainly, most economic and trade initiatives in Europe spring (primarily) from profit-seeking corporations, banking institutions, and others in the investment community – not from forces desiring the well-being of all Europeans. And so conflict is assured until national governments in the Community are formed by forces truly representing the larger population … which address the fundamental weakness expressed in basically flawed inter-Community treaty-making. From the time of the Marshall Plan (at the end of the Second World War) the U.S. set about to re-create Europe as a gigantic marketplace. The creation of NATO (1949) furthered a U.S./European integrated military led by the U.S.A. NATO and U.S. corporate interests worked to encourage the establishment of a European Union. The cry to the public was that an integrated Europe would end the costly and destructive history of war-making there, a noble aspiration that caught the popular imagination. But integral to the communitarian cry was the unending ambition of the global imperialists, of “dark” government, of ‘the deep State’ – whatever name is chosen for the (in fact) fascist One Per Cent – the ambition to be, in fact, the real government of Europe and to exploit its wealth and population. Dieter Grimm puts the matter simply. What he calls “the democratic deficit” of the Union is no longer in doubt and is based upon the transformation of Europe by treaties. The European Court of Justice regards inter-community treaties as the foundation of a European Constitution. It apparently (from what base and/or source of influence?) sees its role as the maker of a European Constitution … through treaty-making – without first demanding that all treaties are based in the protection of fundamental Rights and Freedoms. Apparently an unique situation in Europe, the condition Dieter Grimm describes is, of course, not unique. Across the world, forces of Imperial Globalization (call it what you will) have been shaping so-called Free Trade treaties (with the apparent close co-operation of “democratic” governments in power) which shift sovereign power away from the elected representatives of the people and their carefully constructed court systems to various forms of faceless, “irresponsible”, privately-appointed decision-making bodies. Those bodies oversee the gigantic raid made by private corporations upon populations helpless to prevent the massive grabbing which results from claims that the country in question is interfering with the right of the private corporations to exploit wealth and people. Stripping a people of its fundamental human rights and freedoms clears the way for a world of corporate decision making in which all criteria of effectiveness and efficiency are the criteria of the capitalist entrepreneur. In Europe, cooperation between the Globalizers and supine governments is eating at the fundamental protections of working people, structures to insure universal health care and security in old age … and is proposing to “release” people entering the labour market from any defensive organizations so they will be free (as they were in the slave days of the Industrial Revolution) to – singly and freely as independent entities – negotiate with corporations the terms of their employment. We remember … if the Court doesn’t … that in 2005 the unelected ruling forces in Europe produced a three-volume proposed Constitution for Europe, one which legitimized the neo-liberal structure growing in place. France and Holland rejected it by referendum and, effectively, killed it. Undaunted, the bureaucrats largely resurrected its intentions in the 2007 Treaty of Lisbon. The Treaty did not need referendum approval and was signed into being by all member States, including the governments of France and Holland – flying in the face of what was clearly a democratic expression of the popular will. In 2009 the Treaty of Lisbon came into force. Dieter Grimm argues that the European Court of Justice is “constitutionalizing” treaties … arguing for and accepting them as ‘basic law’, superior to all national law and national Constitutions. Germany, for one, disagrees. In short, at least since 1964 (the Treaty of Lisbon being merely another nail in the coffin of European Union democracy) the European Court of Justice has ruled that all treaties (and, indeed, all Court of Justice rulings) take precedence over national laws and Constitutions. But since that process is constructing, in Jeremy Corbin’s words, an “Austerity State” which is plainly unjust, unequal, undemocratic, and punitive to the larger European population, it cannot survive. Failing an internal reconstruction of the Community – which seems (at present) almost impossible, European Union national populations – sooner or later – will elect governments that set in motion the clause in the European rule-book that begins exit from the Union. Then Britain’s much berated Brexit, voted to begin Britain’s withdrawal from the European Community, will become the rule, rather than – as it is now – the highly criticized exception. Robin Mathews is Professor emeritus at Simon Fraser University in Vancouver. 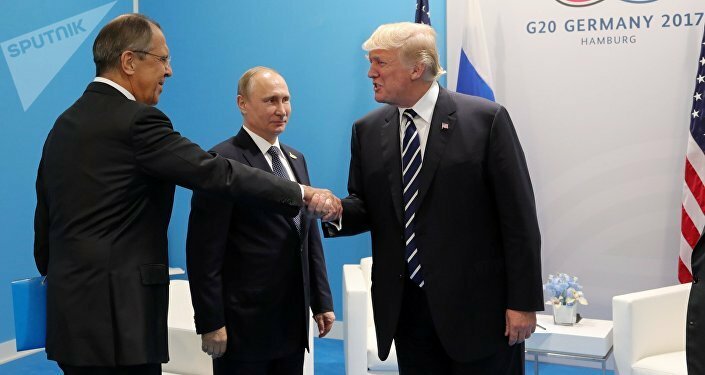 The first meeting between Vladimir Putin and Donald Trump at the G20 summit in Hamburg evoked a wave of criticism from Western media, as a number of notable news outlets blasted the US President for his conduct during negotiations. At least several prominent newspapers took a dim view of President Trump’s handling of this meeting, claiming that the Russian leader apparently managed to outplay and outsmart his US counterpart.For example, Die Welt stated that it was clear to all professional observers that the meeting resulted in Trump’s capitulation. The article’s author also emphasized the fact that Putin paused for a moment before shaking Trump’s already extended hand. “It’s an indication of how rapidly our standards are falling when we’re reasonably pleased that President Trump has not made an obvious error,” Thomas Countryman, former US acting undersecretary for arms control and international security, remarked. Meanwhile the New York Times insists that the meeting with Putin was probably the best part of the summit for Trump, who apparently found himself increasingly ostracized by other delegates. “The talks with Mr. Putin oddly turned into a bright spot for Mr. Trump on the first full day of the gathering, where the United States found itself increasingly ostracized by other Group of 20 members on major issues, including climate change, immigration and trade,” the newspaper says. The Los Angeles Times criticized the way Trump discussed the issue of Russia’s alleged meddling in the 2016 US presidential election, arguing that the US President should’ve been more assertive in his inquiries on the subject. Interestingly enough, the article’s author insisted that “the entire US intelligence community believes the Kremlin mounted a sophisticated campaign” to help Trump win the election, even though this assessment was made only by four out of 17 US intelligence agencies. Sen. Chuck Schumer (D-NY) is one of the leading “lights” of the “progressive Democrats” pushing the Russiagate nonsense. Pettiness or misguidedness is not their sin but criminal complicity in putting humanity —and all life on this planet—at the risk of extinction in pursuit of abject goals.